As soon as they reached the top, Nox plunked down on the floor with a relieved sigh. She stripped off her socks and boots, and sat there wiggling her toes in the chilly, pre-dawn air. “Oh, that’s much better.” She leaned back, palms flat on the cool stones and whistled up a frosty wind to cool off. As she did, a shadow darker than the gloom around them rose up. Grimm spun around, hackles up and growling. The shadow coalesced into a vaguely man-shaped figure. “Who dares summon the winds?” it said, in a breathy, sepulchral voice. “Recessive genes pop up every so often. Bloody effing Hel,” she said, and abruptly sat back down. Nox studied the bars of the cage that held her. Round stones marked with spiral carvings lined the floor in a square, and a matching set were embedded in the ceiling. Roaring columns of pure, elemental fire connected the sets of stones and made up the bars of the cage. She shifted her sight to view the energy signatures, squinting against the glare of the fire. There was no doubt about it; she was not the first ice elemental to be held here. There were traces of chill energy splashed about everywhere, right up to the edge of the fiery bars. These bastards had been torturing her people. Nox clenched her fists, and bit back her temper. Getting angry was not going to get her out of here. The tower shook with another of Grimm’s howls. They ducked under the table and huddled together, with Grimm’s voice ringing in their minds. “Balor, you coward! Get back here and fight! It’s not so easy when you aren’t picking on little girls, is it?” the hound howled. “Lead the way, furball,” Nox said, as she shoveled her gear back into her satchel. Nox started to object, but caught herself. He was a spy, this was part of his job. “Be careful,” she said and squeezed his hand. “A minute, for what?” Nox asked, then blinked in surprise as Grimm disappeared. Loki let her go and kissed her hand. “I’ll see you soon.” He gave Grimm a wave and trotted back the way they came, putting his disguise back in place as he went. “No, really, we might not need a lamp,” he teased. Whurfs of canine laughter echoed around the tower as the portal closed behind them. 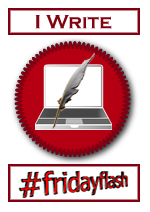 Posted by techtigger in flash fiction, writing. Nox woke up lying face down with her head pounding, and her mouth so dry it felt like sandpaper. She groaned and tried to sit up, but she was so weak she could barely lift her head. All around her was a cage of made of raw, elemental fire, and the hard floor was hot to the touch. There was no sign of Grimm, the courier, or the guard they had confronted at the Inn. She lay still, trying not to be sick and waiting for the world to stop spinning. The man gave her a thin-lipped smile, and pointed to the pile of weaponry. “I like to accessorize for any occasion,” she said, then gasped as the flames moved closer to her. The heat was unbearable, and she couldn’t seem to get any air into her lungs. Loki woke up sopping wet, with the taste of salt in his mouth and a burning sensation in the cuts he had gotten in the battle. He looked up into a pair of worried, sea-green eyes. “I know you’re from House Oceanis, CC, but salt water stings,” he grumbled. He winked. “Always am. “ Ten minutes later he was on his horse and heading out of the compound, riding hell-for-leather into the wilderness. Grimm tested the shimmering curtain of energy that surrounded him. The ghostly hound’s claws scraped across its surface with a noise like tortured metal, making the guards on the other side of the barrier flinch. His cold, mocking laughter echoed in their heads, making them flinch again. “Do you really think this will hold me for long?” he growled. A powerfully built fire elemental entered the room. His hair hung down his back like a tawny mane, and his eyes burned like twin suns. “How the mighty have fallen,“ he said. Posted by techtigger in Blog Tour, flash fiction. Serenna closed her eyes and let the seeking spell flow outwards from her. The spell curled its way through the mansion that was her husband’s ancestral home like a pale, white mist. Generations of ice elementals had lived there, each one adding to the rambling structure that covered the ancient bridge at its foundations. And while the ever-changing floor plan served as a defense against spies from rival Houses, it also provided an endless number of places for one small, inquisitive five-year-old to hide. Three hundred years the sorceress had lived, before deciding to have a child. Perhaps she had waited too long, but when life seems endless you seldom think about the passing years. “Which way did she go after she left?” Serenna said. Serenna thanked him, remembering again to hold her temper. There was no way he could have known that the last time Nox was in the garden, she had climbed the tallest tree and tried to fly. The child was fascinated by the old stories of the House of Winds, and had tried more than once to re-enact scenes from the tales. The guards had managed to get there in time to keep gravity from doing its inevitable work, but only just. The thought was enough to turn her irritation to fear. Serenna hurried her steps, and called for the guards. Nox had nearly everyone wrapped around her little pinky, even that horrid old ghost out in the graveyard. She had made pets of every guardian around the mansion though, so it shouldn’t have been too surprising that the grim was no more immune than anyone else. Several guards joined Serenna in searching the garden, but there was still no sign of her little girl. The rest of the guards’ reports were the same, Nox was not in the mansion. Serenna felt a little lump form her throat, she had completely forgotten what day it was. She knelt down and tried to smooth Nox’s hair. “You know that I love you?” she said. “Always,” the hound said, and bowed before disappearing. Serenna did smile. It seemed she was wrapped around her little girl’s pinky too. Thanks for stopping by! Your next stop for the Mother’s Day Twitter Chats Blog Tour is Donna Carrick of Donna’s Blog. The complete list of participants can be found at the host’s blogs: Mari Juniper and Anne Tyler Lord. The compound had gone quiet, except for the groans of the wounded men and the occasional whinny from the horses. Nox ached everywhere. The energy that the creature’s claws had channeled through her was still making her muscles spasm, but she forced herself to stay standing. Her father had drilled that into head at an early age – a good commander never showed signs of weakness in front of the men. “Yeah, it felt about like that. I’ll live.” The muscles in her legs were still feeling twitchy, so she stayed put. A faceplant would not instill confidence in anyone. “Yes ma’am.” He snapped another salute and jogged back to the inn. “Come up to my room, you can change there.” She got up and gave him a smoldering come-hither look over her shoulder as she walked to the stairs. Loki smirked. “Chicks dig guys that ride fast.” He hurried upstairs, as if eager to get his evening started. Chandra let him in, and then locked the door behind him. He pulled out a hip flask and uncorked it. “One fresh application of masking potion and I’ll be a new man,” he quipped. “I always am.” He winked, and swung out into the hall, cussing loudly about having to leave her warm bed. He stopped short as a rumbling growl came from the shadows.